A round of aPAWS for the new dog park! 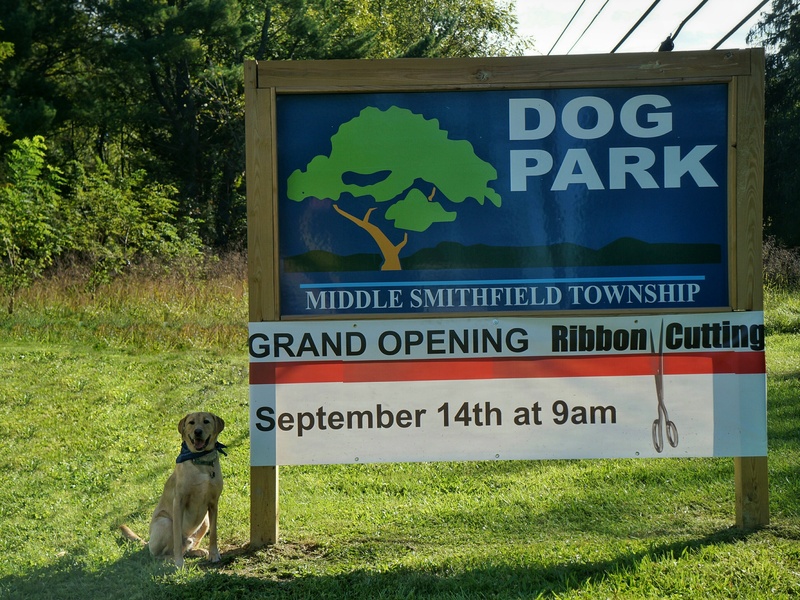 There was aPAWS all around at the ribbon cutting to celebrate the opening of Middle Smithfield Township’s new and improved re-located Dog Park. The Dog Park, which is now located on 108 Leroy’s Lane off Rt. 209/Milford Road (just before you get to the National Park), features two wide open spaces with taller fences and plenty of running room for dogs to stretch their legs. The spaces are separated for small or large dogs, and the whole park is open to the public from dawn to dusk and is free for all dogs and dog lovers to enjoy. The Dog Park was formerly located at the Judy Putek Memorial Park, where it was already a very popular park. In its new location since the “soft” opening earlier this summer, the new Dog Park has quickly become one of the area’s most popular parks. The park contains a walking path around the outside of the dog runs for residents to walk with or without their dogs. The park provides shade, running water, seating areas, and ample “barking”. Present at the ribbon cutting celebration were nonprofit organizations like AWSOM, represented by new president Sandra Fellon and Camp Papillon Rescue. Both were accompanied by furry companions who shook paws, licked faces, and generally approved of the re-located park. The new Dog Park is located on 108 Leroy’s Lane, East Stroudsburg PA 18302, right off of Route 209/Milford Road. More information can be found on the Parks and Recreation page here, for by phone at 570-223-8920.